The VODRV (Variable Orifice Double Regulating Valve) commissioning valve is a circuit control valve for applications such as hydraulic balancing in heating and cooling systems, and adjustment of distribution mains, circuits, heat exchangers, and heating and cooling registers. 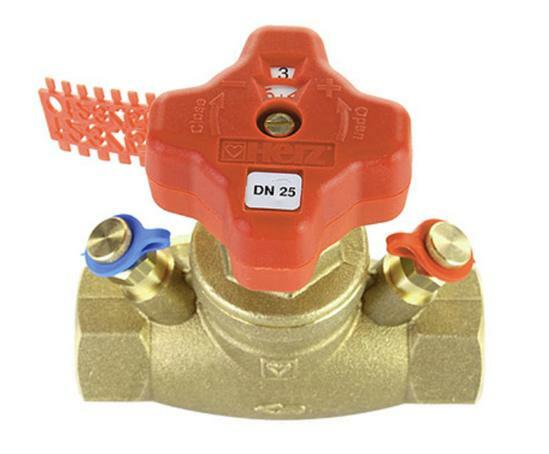 The valve is available as a screw-down model and is made in brass. The double O-ring seals of both the main spindle and the pre-setting spindle ensure complete and lasting tightness and ease of operation. The seals have been approved for a maximum operating temperature of 150°C. The current position of the flow restriction cone is shown on a clearly visible digital display on the front side of the hand wheel. The desired pre-setting step can be easily adjusted and secured by means of the covered pre-setting spindle located inside the valve. The pre-set circuit control valve can be shut-off at any time and/or can be set to any desired position below the fixed pre-setting. The pre-setting spindle is covered by the hand wheel fastening screw and thus protected against unauthorized operation.